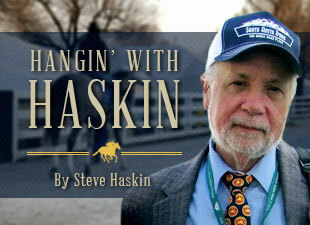 Haskin's Derby Report: A Mud-dled Derby? If this year’s Derby has you confused now, you’ll really be tested if the projected forecast for rain on Saturday holds true. With the rain will come a dramatic drop in temperatures, which would make for a pretty miserable afternoon. The only bright spot would be cashing a ticket on the Derby, and a wet track often produces some hefty prices if you know where to look for them. The reason I’m writing a slop column this early in the week is to assure it will not rain and this column will prove to be a waste of time. Considering it never rains whenever I bring an umbrella somewhere, I’m figuring maybe this will work as well. But just in case my clever ploy to fool Mother Nature fails, here is an early look at who should move up on an off track. At the top of the list is MYLUTE, and you can be assured I will be playing this colt if it comes up wet. Of the more recent stallions, we’re all aware that Mr. Prospector is one of the top off-track influences, but even more powerful and more consistent is the influence of In Reality, especially through his sons Valid Appeal and Relaunch. Mylute is inbred to In Reality, through Valid Appeal and his son Valid Expectations on the dam side and through his son Believe It and continuing through Real Quiet and Midnight Lute on the sire’s side. 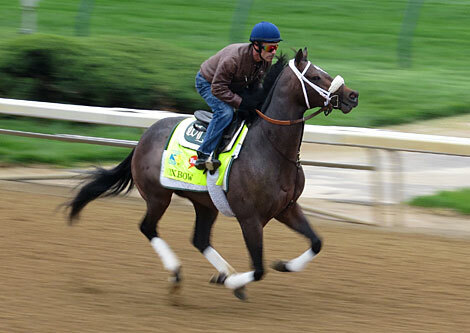 You can bet Midnight Lute’s spectacular romp in the 2007 Breeders’ Cup Sprint over a very sloppy track is mostly attributed to the influence of In Reality. Remember, too, that Real Quiet traces to Dr. Fager, another of the great slop influences from the crop of 1964, which included In Reality and another major slop influence Damascus. Mylute’s tail-female line traces to grass influences The Axe and Hawaii, which also bodes well for his slop form. Speaking of In Reality and his son Relaunch, you will find that potent combination in the pedigree of PALACE MALICE, whose dam, Palace Rumor traces to Relaunch in her tail-female family. Relaunch is the sire of Waquoit, who won the Jockey Club Gold Cup by 15 lengths in the slop. In addition, Palace Malice is by Curlin, who romped in the slop in the Breeders’ Cup Classic at Monmouth, and he has a number of grass influences in his pedigree, such as Royal Anthem, Theatrical, and Roberto. 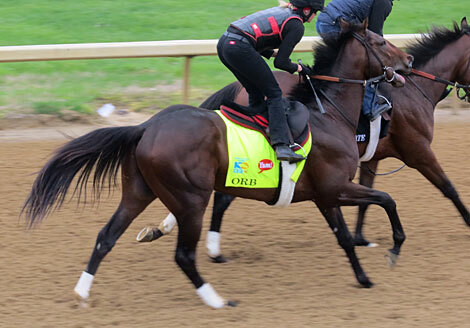 Next we come to ORB, who had as impressive a work on Monday as we’ve seen so far at Churchill Downs. As mentioned earlier, the big names of the late ‘60s – Damascus, Dr. Fager, In Reality, and also Buckpasser all were dominant in the slop and passed that on to their offspring. It would be extremely rare to see a horse with any of these names fairly close up in their pedigree that didn’t love the slop. Well, Orb has all four of them in his female family, and Buckpasser as well in his sire’s family. And on top of that, he is inbred to Mr. Prospector. If you’re looking for any reason at all to bet the Irish invader LINES OF BATTLE, it would be on a sloppy track. With Dr. Fager on top, through Fappiano and a slop-loving Darby Dan family on the bottom, he would move up considerably on a wet track. There has never been a Darby Dan horse that I am aware of that didn’t like the slop, and here you have one of Darby Dan’s most successful families, as well as their huge slop influence His Majesty. He definitely deserves at least a second look at a monster price if the track comes up wet. A sloppy track also should not hurt the chances of REVOLUTIONARY, OVERANALYZE, VERRAZANO, OXBOW, and BLACK ONYX. Verrazano’s tail-female line traces to Dr. Fager through a stout King Ranch family. Overanalyze is inbred 4x4 to Mr. Prospector, and his broodmare sire, Unaccounted For, finished a strong second, beaten a length, to Cigar in the Jockey Club Gold Cup on an off track. Unaccounted For is by Private Account, a son of Damascus, so there is plenty of slop breeding right there. Oxbow traces to In Reality through Relaunch and Cee’s Tizzy, and Black Onyx is inbred to Mr, Prospector top and bottom, and also has Damascus and Buckpasser in his pedigree on the dam side. Here are a few images from this morning’s activity. As mentioned earlier. Orb could not have worked better and was sheer poetry gliding by his workmate with smooth, effortless strides before opening up by some 10 lengths on the turn in the gallop-out.. He completed the half-mile in :47 4/5, out five panels in 1:00 4/5. This work was as close to perfection as you’ll get, and you could hear the enthusiasm and optimism in trainer Shug McGaughey’s voice talking about it. I thought Oxbow was very strong, and was moving with such conviction nearing the quarter pole, jockey Gary Stevens appeared to let him take the turn for home wide, so not to slow down his momentum. He leveled off beautifully in the stretch and finished up strongly all on his own to complete the five furlongs in :59 4/5. I also loved what I saw from Itsmyluckyday in his first gallop over the track. As I said yesterday, it’s like this is his home track, he moves over it so well. Oxbow, with Gary Stevens aboard, is starting to get the juices flowing as he gallops up to the pole before his work. 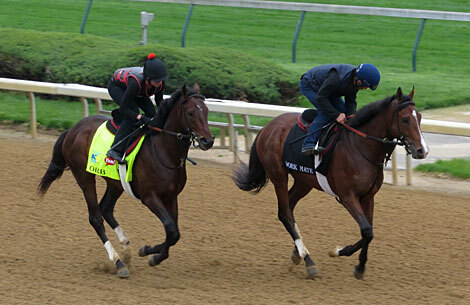 Orb calmly gallops to the pole behind stablemate Overwhelming. Now it is time for action as Orb starts to get competitive and is ready for action. 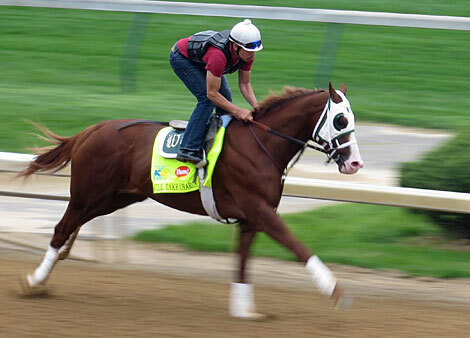 Will Take Charge begins his five-furlong work in 1:01. 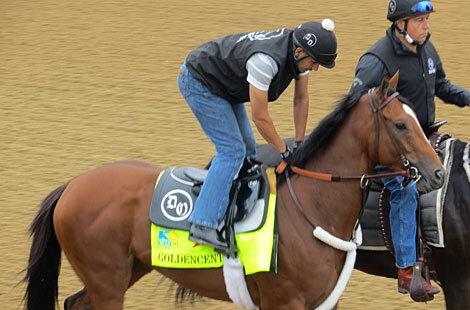 Goldencents heading for his first gallop over the track.